Trinidad and Tobago 9-135 (Denesh Ramdin 48, Evin Lewis 19, Alister McDermott 4-37) beat Brisbane Heat 110 (Joe Burns 45, Ben Cutting 17, Ravi Rampaul 4-14, Sunil Narine 2-25) by 25 runs. Trinidad and Tobago smashed 135 runs for the loss of nine wickets in the allotted 20 overs and the innings of Brisbane Heat scrambled at 110 with 8 balls still left in the game. Denesh Ramdin was announced ‘Player of the match’ for his courageous knock of 48 runs. The second match of the Champions league Twenty20 was played on Sunday, September 22, 2013, at JSCA International Stadium Complex, Ranchi. Earlier, James Hopes, the skipper of Brisbane Heat, won the toss and elected to field first. Lendl Simmons along with Evin Lewis went in to bat for Trinidad and Tobago swiftly and Simmons hit three back to back fours in the third over but lost his wicket for 14. Darren Bravo was gone for a duck and Lewis became the next victim at 38 after scoring 19 runs. Jason Mohammad and Denesh Ramdin got together and the latter hit a couple of fours in the sixth over. The first six of the innings was dispatched by Ramdin in the 9th one as Nathan Hauritz struck twice in the 11th over by removing Jason Mohammed and the newcomer Sherwin Ganga. Denesh Ramdin was the only batsman who resisted against the lethal bowling of the rival team whereas the wickets kept on crumbling at the other end. He added 12 runs in the 15th over with 1 six and 1 four and became the 9th victim for 48 off just 38 balls with 2 lofty sixes and 4 fours. Samuel Badree remained unbeaten for 15 off 7 with 2 sixes as Trinidad and Tobago scored 135 with one wicket in hand after 20 overs. Alister McDermott was the top wicket taker with four , Nathan Hauritz held two whereas Kemar Roach, Ben Cutting and Daniel Christian shared one wicket each. Brisbane Heat lost their first wicket at 10 as Peter Forrest joined in with Joe Burns and took the score to 31 in 7.5 overs. Forrest was caught by Ganga off Badree for 16 and was replaced by Daniel Christian. Burns kept on consolidating by hitting 2 sixes and 1 four in the coming overs as Daniel Christian was declared leg before wicket off Rayad Emrit for 13. The middle order batting surrendered against the calculated bowling attack of Trinidad and Tobago and they were reeling at 5-85 in 14.5 overs. Joe Burns multiplied the miseries of Brisbane Heat when he was clean bowled by Ravi Rampaul for 45 off 43 balls with 2 sixes and even fours. Ben Cutting was the lone fighter in the middle order as the lower order batsmen were unable to enter the double figures. He was run out for 17 off 10 deliveries with 1 six and 2 fours as the entire Brisbane Heat team was bowled out for 110 in 18.4 overs. Ravi Rampaul was the star performer with four wickets, Rayad Emrit and Sunil Narine chipped in with two each and Samuel Badree got one wicket. 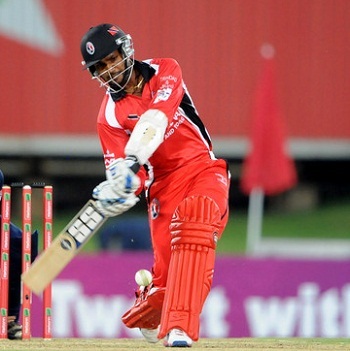 Trinidad and Tobago triumphed against Brisbane Heat by a reasonable margin of 25 runs and got four points.